A pincushion post would not be complete without mentioning my dear buddy, April aka Momosclothes. Scroll down to the bottom of her Ebay ME page to see some of her beautiful pincushions. Pictured at the beginning of my post is one of the first ones I received from April…so beautiful!!! I love pin cushions and I plan on making a new one. Thanks for the great link ideas. This 30 day plan is awesome and I wish I had time to jump in on it – maybe I can catch up on the weekends…. Hey Esther! I’m already behind on both my projects. I’ve made the majority of the pincushion…just need to sew it closed, wrap the embroidery floss around it, and finally add a button to the center. Oh I have such sewing-envy (is that a word?) right now it is not even funny. If I were to try and make that It would be held together with hot glue and duck tape……I work with paint, and um did not have the patience with sewing, sigh. LOL Jamie…yes, there is such a thing as sewing-envy! Don’t don’t be jealous…my pincushion probably would have looked a little better if I used my glue gun as it’s not exactly what I would call ROUND…haha! 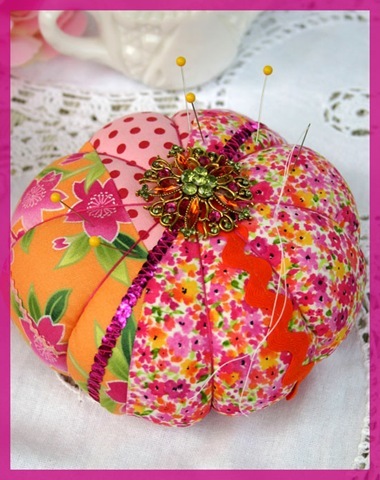 Sorry, I didn’t read the pincushion tutorials…I am just WAY to ADD for that! Is it wrong if I make my pincushions from a yo-yo? I got the same result as the pictured one, I made the yo-yo then stuffed it like a pillow and hand stictched a non-stuffed yo-yo to cover the bottom. I just can’t follow patterns to save my life so I have to make my own. I do use commercial patterns for pull on pants or peasant tops, I just throw away the instructions first!!! LOL Phobiamom…that’s the basic concept, so it will certainly work. I must admit I never really follow directions as I usually have a quicker or better way to accomplish the finished results. Great lists – I’m going to have to bookmark these. thanks Lil’ d…I’ve added your adorable apple pincushion to the above list of tutorials! Hello All, I’m looking for a turtle pin cushion pattern. Can someone point me in the right direction?